Update: AT&T, welcome to the party. 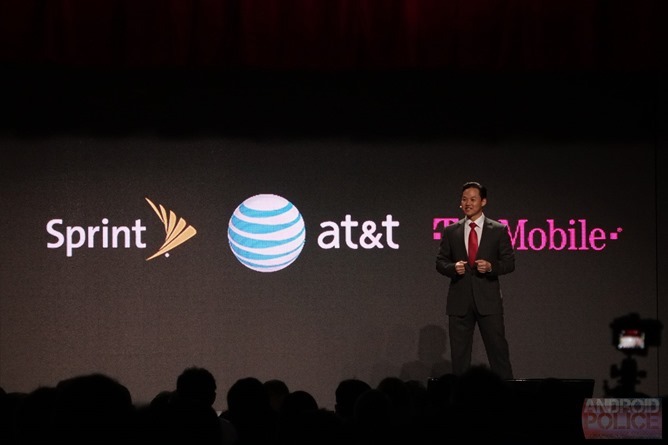 At the LG CES press conference the company let loose some welcome news for the American market: their unique G Flex smartphone will be coming to AT&T, T-Mobile, and Sprint carriers at some point this year. (Sorry, Verizon customers, looks like you're last one out again.) 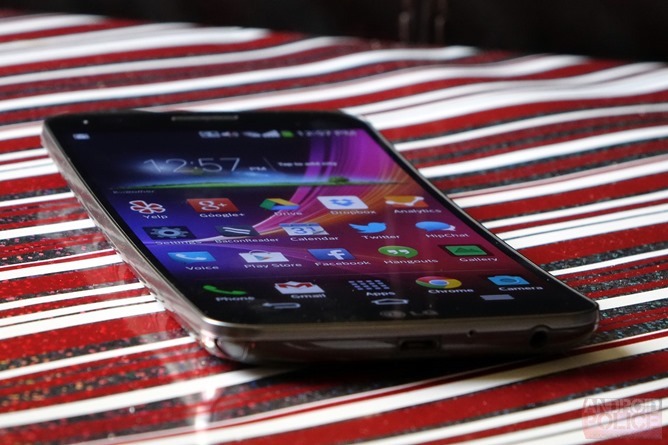 If you'll recall, the G Flex is LG's high-end flexible, curved-display phone announced late last year. T-Mobile has confirmed that they will carry the G Flex in a separate press release. The G Flex uses a 6-inch, 720p OLED screen that curves inward, banana-style, and the body conforms around it. The body can actually be bent to a small degree without cracking or warping, and the rear of the phone is covered in a self-healing material that "erases" scratches and dings after a few minutes. The G Flex uses on-screen navigation buttons and the same below-the-camera physical button layout as the LG G2. Inside the international version is a 2.2Ghz Snapdragon 800 processor, 2GB of RAM, a 13MP rear camera, a massive 3500mAh non-removable battery, and 32GB of storage. Aside from the low-resolution screen the device is very high-end, and converted prices from Korea put the G Flex at over $900 USD. (It will probably get the same $600-700 unsubsidized price tag as other high-end phones when it reaches the US market.) David Ruddock gave the international version a full review, and found it an interesting but flawed device. LG didn't mention price or date information in the CES press conference, and T-Mobile only says that it will be shared "in the coming weeks." Evleaks previously posted that the G Flex was coming to these three carriers, so I would expect the G Flex to hit them sometime before the summer. LAS VEGAS, Jan. 6, 2014 /PRNewswire/ --LG G Flex, the world's first curved, flexible smartphone*, will be available in the United States during the first quarter from Sprint, AT&T, and T-Mobile, LG Electronics announced today at the 2014 International CES®(booth #8204). "Combining unparalleled consumer benefits with the best of LG's technological advancements, the LG G Flex represents the shape of innovation, a harbinger of the future of smartphones and is poised to reinvigorate excitement in the category during 2014," said Morris Lee, senior vice president and head of North American sales and marketing, LG Mobile Communications Company. Purposefully designed to provide a cinematic viewing experience and ergonomic comfort, the innovative new LG G Flex incorporates many of LG's futuristic technologies while still being a practical option for today's discerning consumers. A six-inch curved Plastic OLED HD display designed by sister company LG Display and a curved battery developed by LG Chem work in tandem to give LG G Flex its world's first ergonomic curved, flexing form factor and the ability to overcome limitations of traditional flat smartphones. The LG G Flex offers an outstanding voice and sound experience because the distinctively curved, flexible design follows the contour of the face. "We are excited to collaborate on the G Flex with LG, a leading innovator that is shaping mobile innovation with the first curved, flexible smartphone," said Murthy Renduchintala, executive vice president, Qualcomm Technologies, Inc. and co-president, QCT. "At the heart of the new LG G Flex, the Qualcomm Snapdragon 800 processor helps to enable advanced features and capabilities for the best user experiences, in one of today's smartest devices." Complementing the immersive viewing qualities of the LG G Flex, QuickTheater™ offers quick access to photos, videos and YouTube videos directly from the lock screen with a simple dragging gesture. New is Dual Window, which divides the screen into two separate applications so users can drag and drop information, such as articles and links between windows. The LG G Flex also incorporates the intuitive rear-key design first launched with the award-winning LG G2, and adds new user experience features. Urgent Call Alert changes the color of the rear-key LED based on the number of calls missed, and a face detection indicator changes the color of the LED when the camera is in focus for more accurate selfies. The LG G Flex also includes LG's exclusive Knock feature so users can quickly activate or turn off the display with two simple taps on the screen. 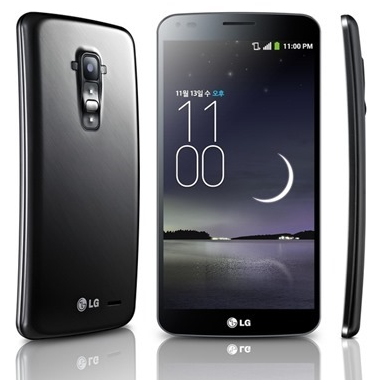 The LG G Flex was first released last November in South Korea and then Hong Kong and Singapore in December. Pricing and availability for U.S. carriers will be announced at a later date.